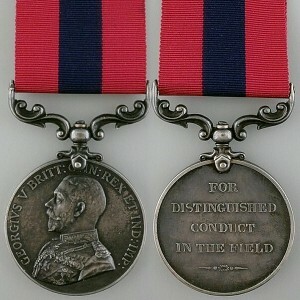 The Distinguished Conduct Medal (DCM) was established by Queen Victoria on 4 December 1854 and was issued in recognition of distinguished, gallant and good conduct shown in the field by warrant officers, non-commissioned officers and men of the British Army and those of her commonwealth, dominions and colonies. 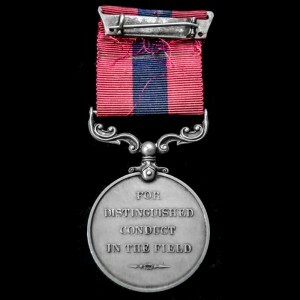 It was the first such award for ‘other ranks’ and was second only to the Victoria Cross in prestige and importance. 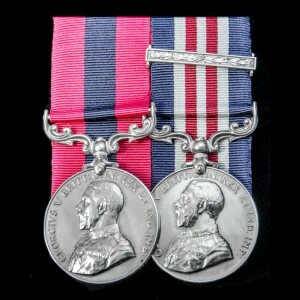 A Bar to the DCM was introduced in 1881, and could be awarded in recognition of each subsequent act of distinguished conduct displayed by the recipient. Approximately 25,000 were issued during the First World War, with all awards notified in The London Gazette with full citation. 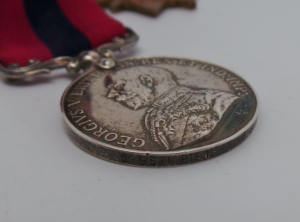 Cast from solid silver, the obverse of the DCM bears the head of King George V inside the Royal Cypher, with the lettering ‘FOR DISTINGUISHED CONDUCT IN THE FIELD’ embossed on its reverse. All DCMs were named and, with few exceptions, were impressed from 1914 onwards. Bars were rarely issued bearing the date of the second award, with the vast majority being plain. The ribbon is crimson with a broad, central navy blue stripe. 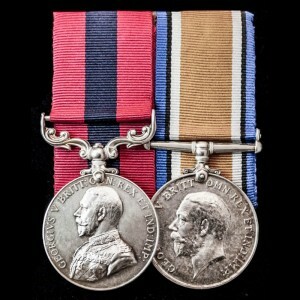 During the First World War, the Military Medal was introduced as an alternative to the DCM after concerns were raised that the increased demand for medals would damage its prestige and value. All recipients of the medal were entitle to use the post-nominal letters DCM.